It’s not unusual to hear about swarms of honey bees showing up in strange, very public places—one actually planted itself on a museum sign dedicated to the memory of Muhammad Ali last year, a sign ironically adorned with his famous catchphrase: “Float like a butterfly, sting like a bee.” In Greenville, South Carolina, its Village area received a similar sight, but this time it was on the rooftop of a restaurant called Golden Brown and Delicious, and it was a bit more planned than a random swarm of bees just showing up. The restaurant owner, Alex George, began working with a local pest company, Gregory Pest Solutions, in order to take part in its new honey bee program. 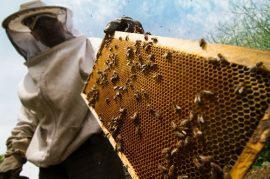 According to Matthew Tancibok, who is a beekeeper to dozens of colonies and a bee specialist with Gregory Pest Solutions, “It was something I just got into. It was almost kind of accidental, and I nerd out on them big time. I can’t help but love everything about [honey bees]—they are amazing insects.” Being such a bee enthusiast, Tancibok heads Gregory Pest Solutions’ protection program for pollinators, which he came up with back in May of this year to help honey bees they came across. Ready to try the sweet nectar of honey bees? Our Manuka honey tastes like no honey you have ever had before! To find more about our products or to get an order started, click here.